As I began to read this I thought it was the third in the Rougon-Macquart series – and it is, in a sense. It’s the third to be written, to be precise – but halfway through I found this list which shows a reading order suggested by Zola himself in the final book, Le Docteur Pascal. I considered going back and starting again, but decided not to for three reasons. Firstly the narrative isn’t linear anyway, and what I’m looking at is the process Zola went through rather than the story itself. Secondly I’ve already read ‘La Curee’ so the order is out already. And thirdly, most importantly, I’m tired of the selfish, spoiled Rougons and want a taste of the earthy Macquarts, but Zola’s order has all the Rougon books stacked at the start. Somewhere near the entirety of the plot takes place in Les Halles, the huge central market built during the 1850s in Paris. 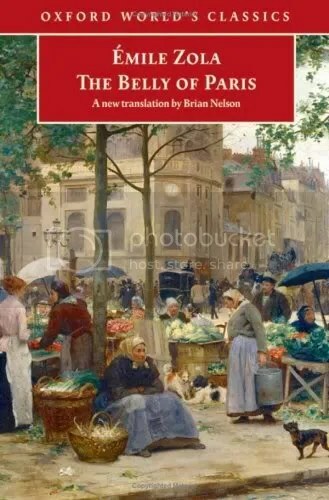 I’d been shamefully unaware of Les Halles as being anything other than a station on the Paris Metro, but in its time it was indeed the “belly” of Paris. All the produce from the surrounding areas would be brought into Paris each morning and sold there. For the capital of a nation so food-orientated to have a single gigantic structure supplying all its needs is quite something, and it’s a real shame it was knocked down over a decade before I was born. Much of La Curee consists of long, poetic descriptions of foodstuffs. In La Curee this quickly became tiring, but here it work perfectly. The masses of produce on sale, the smells, the colours – these all reflect the central theme of consumption, contentment and fatness which is unable to cope with Florent’s troubles, skinny discontent. Unlike the ‘decadence leads to depravity’ concept, this rings true even today, especially in China. The only time the prose stops working is in the description of a plot taking shape in a cheese storeroom, where the metaphor of deceit being reflected in the ripe fermented smells of the rotting cheeses becomes a little strained and ridiculous. It was a great surprise to learn that this is the most famous scene in the novel, and it’s hard to know whether to chalk this down to personal taste, translation problems or the passage of time. On the whole ‘Le Ventre De Paris’ is excellent in both concept and realisation, and without wanting to engage in hyperbole, I’d say it’s probably the first masterpiece of the series. Not a great deal of this evident, as the only Rougon-Macquart family characters present are Claude Lantier (who will have his own book later) and Lisa, Quenu’s wife. Lisa seems to be a woman driven by her own ambitions, rather than any kind of inheritance – her only connection being her hatred of her father’s laziness, which can hardly be said to be a genetic link. No film made yet. While it has very much a literary style, a good screenwriter could do something pretty special with the material.